Montreal just put hundreds of shelter dogs on notice: Get out of the city now or get put down. The Canadian city's new law, which was passed on Tuesday, is a terrifying ultimatum for animals whose only crime is being born a pit bull — loosely defined as American Staffordshire terriers, Staffordshire bull terriers, American pit bull terriers or any mix of these breeds. It turns out there are a lot of ways to save these dogs. But not a lot of time. 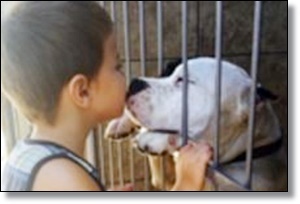 By October 3, just days from now, the legislation will prevent any pit bull from being adopted from the city's shelters.